(alternative cruise on: 31 Dec). Sit back, relax, order a drink and enjoy a journey through jazz as you cruise the Vltava River in Prague. The Prague Jazz Boat sails through the heart of the city, passing under Charles Bridge and through the city lock. Participants will enjoy unparalleled views of Prague Castle, Lesser Town, National Theatre, Vysehrad and the other famous riverside attractions in Prague. A jazz band entertains throughout the cruise with a music programme which can vary from traditional Jazz, Latin, Cuban, Brazilian and Ethno Jazz, to Swing and Blues. Unlike our other evening cruises, dinner is not included in the price on the Prague Jazz Boat. Instead, choose from a selection of hot and cold meals on the night, which will be served to your table by your waiter. It is not obligatory to eat, you can just order drinks. The interior of the boat is heated in the winter and air-conditioned in summer. You can choose to dine at the table reserved for you inside or move to another up on the sun deck. This is a river cruise for all seasons and weather conditions. The bar on board serves a range of beers, wines, sparkling wines, spirits, and hot and cold soft drinks. The Prague Jazz Boat is a popular river cruise if you like to relax and enjoy a full jazz entertainment programme, with the option of dining if it suits on the night. TIP: Book this cruise through Prague Experience and receive a premium table by the window, inside the boat, with good views of the sights along the river and of the musicians. 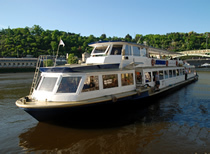 -Prague A La Carte Dinner Cruise. River cruise + Welcome drink + Jazz band.